The Alfa Romeo Giulia is coming off a banner year where the premium luxury sedan was awarded Motor Trend’s 2018 Car of the Year. And that comes as no surprise, as the 2019 Alfa Romeo Giulia is a prime example of form meeting high-performance function. Its graceful design belies the powerful engine that lies underneath the hood, with a base of 280 horsepower and a maximum of 505 HP in the top-line Quadrifoglio trim. On the other hand, a competitor to the 2019 Giulia is the 2019 Mercedes-Benz C 300 Sedan, which is fairly powerful and fast, but not nearly as power-packed or as speedy as the Giulia. While the 2019 Giulia reaches speeds upwards of 191 MPH in its top-line trim, the 2019 C 300 only reaches as high as 130 MPH. In addition to the 2019 Giulia's impressive advantage in top speed, it also surpasses the 2019 C 300’s pedestrian 255 horsepower and its top 0-60 time of 5.7 seconds. The 2019 Giulia goes from 0-60 in a blistering 3.8 seconds in its Quadrifoglio trim. 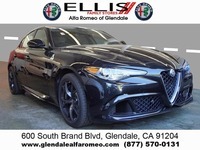 Beyond the performance advantages the 2019 Giulia boasts, it also comes with Apple CarPlay and Android Auto, has available Alcantara leather accents, and is more affordable in its base trim option than the 2019 Mercedes-Benz C 300. It’s a clean sweep for the 2019 Alfa Romeo Giulia. Questions? Want to take a Giulia for a test drive? 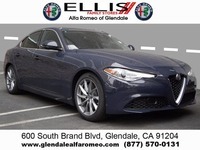 Visit us on the lot at Alfa Romeo of Glendale, 600 S. Brand Blvd., Glendale CA. We also serve the Los Angeles, Pasadena, Burbank, Van Nuys, Sherman Oaks, Woodland Hills and Thousand Oaks areas, among other local cities. Please call us at (818) 500-1750 or visit us on the lot so we can set you up with a test drive of one of these models on sale right now.